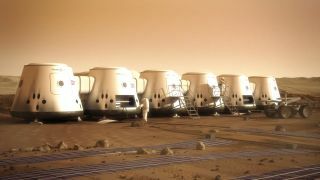 The Mars One mission aims to send humans on a one-way trip to the Red Planet. The mission aims to land the first Mars colonists on the planet by 2023. Applicants over the age of 18 from any country are eligible to apply, and Mars One has received more than 165,000 applications already. But what sort of person would go? Who wants to go to Mars? Aaron Hamm, 29, is a hotel manager, but going to Mars is "literally something I've wanted forever," he said at the meeting. After hearing about the call for applications, "I couldn't not jump at the chance," he said. Leila Zucker, 45, is a married emergency room doctor. "Since I was a little kid, all I wanted was to be a doctor and travel in space," Zucker said in her application video. She even composed a song about her goal: "We're about to take off for the Red Planet Mars because Mars One leads the way to the stars," she sang at the meeting. Austin Bradley, 32, is a physics student and former imagery analyst and paratrooper for the U.S. army. Bradley was hard to miss at the meeting, sporting green hair and wearing alien antennae, but his ambition was serious. "I always wanted to apply for NASA," he said, but now he sees Mars One as his ticket to space. Joseph Sweeney, 24, is a graduate student in applied intelligence. "I feel like you're born knowing you want to travel," said Sweeney, who started the Facebook Aspiring Martians Group, which now has 1,844 members. The Mars One colony mission poses many risks. There's the launch, the six-month journey, the landing — and that doesn't even include surviving once the astronauts get there. At the Million Martian Meeting, applicants on the panel were asked what level of risk they would accept. Specifically, what chances of making it to Mars and lasting two years would make the trip worth it? Zucker said she would take a 50-50 chance of surviving two years, or a 1-in-100 chance for surviving 20 years. "None of us are planning to die," she said, "but we all recognize we could." Sweeney, a self-described optimist, said he would go even if the odds were 99-to-1 against surviving. "As long as there's a small possibility to do something great, I think it's worth the risk," he said. What about a mission that would keep them alive only a year? Bradley and Hamm said they would still apply. "It was always a one-way trip," Bradley said. Hamm said he would use the year to build his own survival system. "Just get me boots on the ground," he said. Zucker added that it would depend how much she could accomplish in that year. "That year has to count — you don’t get my life for nothing," she said. Just as Neil Armstrong's "giant leap" speech is forever enshrined in history, the words of the first humans to set foot on Mars will likely be historic. At the meeting, the four panelists were given a chance to preview what their first utterance on the Red Planet would be. Sweeney paraphrased a quote from Robert Zubrin's sci-fi story "First Landing," saying, "I take this step for all mankind, so we may walk among stars." For Hamm, the answer was simple: "For decades we have left tracks on Mars, and now we are leaving footprints."